Next week many public school teachers in Oklahoma are staging a walkout to gather in Oklahoma City at our capitol. There are multiple goals for different teachers and educator groups for the walkout, and securing a pay raise from the state (which has not happened in 10 years, not even a cost of living increase) is one of them. The walkout is not just about teacher salaries, however. The Oklahoma teacher walkout is also about repeated cuts to other state agencies which serve the children and families of our state, and the need for our state lawmakers to pass long term revenue raising legislation that will address the financial quagmire in which we currently find ourselves as Oklahomans. This past Friday evening, my wife Shelly (@sfryer) and I attended the last half of an evening town hall meeting at Wilson Elementary in Oklahoma City Public Schools (@okcps). Speakers included Representative Cyndi Munson (@CyndiMunson85), Senator Kay Floyd (@KayFloydOK), and Representative Jason Dunningham (@jdunnington). 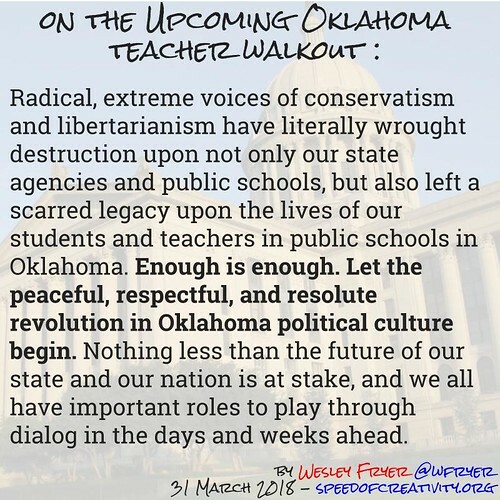 In this post, written on March 31, 2018, I’ll share some reflections on our Oklahoma teacher walkout next week and the bigger struggle we have before us Oklahoma voters and taxpayers. Before sharing these observations, I’ll note that Shelly and I are parents to a current senior in high school at Classen School of Advanced Studies (ClassenSAS) in Oklahoma City Public Schools, as well as a ClassenSAS graduate who is now a sophomore in college. I have served as a public school teacher in Oklahoma (Yukon Public Schools) and Shelly taught for 4 years at Positive Tomorrows in Oklahoma City, a privately funded school exclusively serving homeless children and their families. Both Shelly and I have been educators respectively for 20+ years each, and currently serve as a third grade teacher (Shelly) and technology director (Wes) at Casady School in Oklahoma City. Our youngest child attends Casady in 8th grade. We’re highly invested in public and private education in Oklahoma, and committed advocates for education and children here in our state and literally on a global scale thanks to our social media connections and educator networks. None of the comments and opinions expressed here (as always) reflect those of my current employer. These are my thoughts as Wes Fryer, current OKCPS parent, lifelong educator, Oklahoma taxpayer and voter. One of the most important points made at Friday’s town hall meeting at Wilson Elementary, by Representative Jason Dunningham (@jdunnington), is that Oklahoma teacher voices can be powerful and ARE powerful right now. Rep Dunningham said many of our Oklahoma legislators are scared right now of the prospect of teachers descending on the state capitol next week. In the past when Oklahoma teachers have descended on the capitol in large numbers, some legislators actually locked their office doors or left their offices to avoid meeting with teachers. This could happen again, and if it does, (this is my thought) then it should be documented with photographs and video, and shared on social media. State officials are elected to do many things, and one of them is to meet with constituents and listen to their ideas. It is eye opening to hear about how FEARFUL some of our Oklahoma state officials are today about the prospect of teachers and other voters exercising our democratic rights to gather, speak, protest, and meet with elected legislators. Representative Dunningham was clear and unequivocal on this point: Our Oklahoma state legislators finally took action to pass a historic tax bill (the first tax raising bill in 28 years) last week because many want to PREVENT teachers from not only coming to our state capitol April 2, but also STAYING LONGER than one day. The March 28th article by William Savage (@thricesavage) for NonDoc (@NonDocMedia), “Historic vote: House hits supermajority on revenue plan,” provides a good summary of that legislation on Wednesday. It’s important to note the following day, however, the Oklahoma House voted to cut $50 million of the required funding for that teacher pay raise, which was to come from a new hotel/motel occupancy tax. See KFOR’s (@kfor) March 29th article, “House Democrats speaking out after repeal of hotel/motel tax” for background on this, and particularly attend to the comments by Rep Dunningham. Unless other tax raising legislation is passed, YET MORE CUTS to other Oklahoma state agencies will be required to fund the teacher pay raise at it stands now. This is unacceptable. That’ll be up to the teachers, but I hope they can come up here [to the state capitol] and say ‘thank you’ on Monday and go back to the classrooms. Oklahoma teachers deserve and should expect their voices and and opinions to be listened to and respectfully considered by elected officials. No one should silence the voices of Oklahoma teachers. To the contrary, we should empower and amplify the voices of Oklahoma teachers to tell their stories from the classrooms of our public schools. If you’re headed to the Oklahoma capitol next week as a voter and citizen, keep this in mind. Some of our elected officials may want to silence your voice and prevent you from exercising your rights as a citizen to both express your views and assemble, but you have a RIGHT to do these things. We need MORE DEMOCRACY and democratic engagement in Oklahoma today, not less. Our civic participation is essential, needed, AND constitutional. Another key message from Representative Jason Dunningham (@jdunnington) at Friday evening’s town hall meeting was to “tell your stories to your legislators.” When Oklahoma teachers and other voters come to our state capitol this week (and perhaps for longer) to meet with legislators, keep this in mind. It’s also VERY important, when we are discussing issues like these about which we are passionate and have strong opinions, to remain civil, respectful, and polite. This was an important point shared by Representative Cyndi Munson (@CyndiMunson85) at Friday night’s town hall. If you’re headed to our Oklahoma capitol this week, even when you’re meeting with a state official who has an opposite opinion to yours, remember to take the high road and choose kindness. Yes many of us are frustrated and angry, and yes we want our state elected officials to take action to remedy the economic emergency we find ourselves in today in Oklahoma. Angry confrontation is unlikely to be constructive, however. What CAN be constructive when it comes to meeting with legislators and others, however, is SHARING OUR STORIES. Share your story in person, and share it online. Share it on Facebook, on Twitter, on your personal blog, or somewhere else. Use the hashtag #OklaEd to find a wider audience for your story. As Oklahoma educators, we are well connected with social media. Follow this Twitter list of almost 1000 Oklahoma educators. Amplify other Oklahoma educator voices. Most of all, however, remember to TELL YOUR STORY with kindness, respect, humility, and love. It’s one of our most effective weapons to change hearts and minds in this struggle for our students, our communities, and our future. In Friday’s townhall meeting, Representative Jason Dunningham (@jdunnington) was clear that to be effective, the Oklahoma teacher walkout needs to last longer than one day. Rep Dunningham stated that many Oklahoma lawmakers will be both surprised and nervous if Oklahoma teachers continue to show up at the state capitol on day 2, day 3, day 4, or longer following the April 2nd launch of the walkout. Governor Mary Fallin and some (or many) of our current Oklahoma legislators want this teacher walkout to be a one-day flash in the pan. They should be embarrassed by the way their lack of leadership has put our state in an economic quagmire. Webster’s defines quagmire as “a difficult, precarious, or entrapping position.” We cannot find our way out of our funding quagmire in Oklahoma with the limited legislation that was passed last week in the House and the Senate. YES it was historic, and YES it was a step in the right direction, but NO it was not enough. To effectively pressure our Oklahoma state legislators to take action that addresses long term economic needs of our state and state agencies, the teacher walkout needs to be MULTI-day and not just a ONE-day event. As previously noted, Oklahoma teachers are staging this walkout not only because our teachers DESERVE a substantial pay raise, but also because our state has severe funding problems which must change. We’ve got to take a long term focus when it comes to raising revenue in Oklahoma. We must consider our values and the kind of state in which we want to live. The number of cuts which our state agencies have been forced to take in recent years is tragic and continues to have devastating consequences. A political culture has been built and maintained in Oklahoma FOR YEARS that needs to change. The highest value motivating all our elected officials should not be simply low taxes and maximized profits for corporations as well as wealthy individuals. Providing excellent schools and learning opportunities for our students and teachers, providing outstanding (not just “adequate”) state services, maintaining our roads and bridges, insuring that foster care and mental health services are available, seeking to rehabilitate when appropriate and not simply punish all law breakers….. the list goes on and on. We need sea change in our political culture in Oklahoma. The lack of funding in our schools is but a symptom of a larger problem, and we need to address these root causes to change our political culture. Cultures do not change quickly, and that is why (as Senator Floyd aptly observed) we need to take a LONG view on these issues as well as having our list ready for short term demands. I’m reading it now and am not finished, but am sharing some of the highlights as well as my takeaways with the Twitter hashtag, #DarkMoney. An archive of my tweets with the #DarkMoney hashtag is available via my TweetNest site. Beyond the Oklahoma teacher walkout which starts Monday, we need to look for action steps which we can all take as citizens and voters regarding needed state funding and our quality of life within our state. Both Representative Cyndi Munson (@CyndiMunson85) and Senator Kay Floyd (@KayFloydOK) addressed this issue at Friday evening’s town hall meeting. Senator Floyd reminded attendees of how important it is that parents are talking to parents! Strengthening each school’s Parent-Teacher organization, encouraging more parents to attend meetings and participate, and supporting other groups within our communities which bring parents together with opportunities for dialog are essential. Representative Munson reminded attendees that “we all have circles and spheres of influence,” and we need to delicately (at times) and appropriately find ways to talk about these issues within those arenas. This even includes church. For our family, church is one of the primary places where we have opportunities to engage in conversations and “dialog” (a meaningful exchange of perceptions in a non-threatening environment) with people outside our workplace and generally education-focused environment. Both my wife and I work at a school, and it’s so important that we find ways to step outside that “box” regularly and engage in conversations with others in our community about different issues. Senator Floyd is one hundred percent correct in highlighting our need to find ways to encourage and strengthen opportunities for dialog within our communities. I believe the EdCamp movement and EdCampOKC specifically are excellent examples of ways we’re moving forward with dialog in educational circles, but these need to widen to include more people in our communities. I’m going to keep working on the idea of an Oklahoma City area EdCamp focused on “Digital Citizenship” as part the work I’m doing on digital citizenship for our school. There’s a LOT more we can all do within our civic groups, churches, and other organizations to address these needs and issues. In Oklahoma and elsewhere around our nation, we need MORE DEMOCRACY rather than less. Here in the midwest of the USA, we don’t tend to have many marches or protests. We tend to be, politically, a rather passive group of folks, and for our democratic institutions to grow in healthy ways rather than wither on the vine, I’m convinced this needs to change. If you don’t live or work in a community with an underfunded public school, you might not have a very clear picture of how stark the inequalities are between schools that may be only separated by a few miles or less. Our schools may be officially desegregated, but we are (at least in Oklahoma City and many other urban areas) a long way from the fully funded, diverse and thriving community schools which our children and families both need and deserve. Democracy works best when moral, informed public servants are elected into positions of authority, and voters remain both informed and active in the political process to insure those officials remain sensitive and responsive to constituent needs. Our lives are extremely busy and demanding today, and many people are challenged to make monthly ends meet. This leaves little time for community involvement and specifically, political engagement. These are enduring challenges as well as needs we need to confront and address together. The “political experiment” which is the United States of America remains exceedingly young in the annals of human history. It is vital that our system of democratic governance continue to evolve and change, as our framers expected and intended it to. Rather than be dominated by the wealthiest voices or the loudest voices, we need to support and maintain a political culture which supports input from a diverse number of groups as well as individuals. We need to support and celebrate compromise, however, rather than extremism and radicalism, to move forward into our shared future. As recent events with our 2016 Presidential election have shown and continue to reveal, this is a big challenge when powerful tools for persuasion and influence are put at the fingertips of any advertiser willing to pay. In the past, leaders have emerged in our history to help guide us through difficult times fraught with challenging choices. We need to identify and support those leaders today, and also support institutions within our communities and nation which can help us follow a path of light out of our present civic darkness. In Oklahoma as well as many of our other midwestern states in the USA, we have divides between urban and rural citizens which need to be addressed. This divide manifests itself when we hear calls for school district consolidation in Oklahoma, and when local control topics like setting the minimum wage and property taxes are discussed. A number of Oklahoma school districts have asked their teachers to vote on participating in the walkout next week, and some have decided not to get involved. Andrea Eger’s (@AndreaEger) March 18th article for the Tulsa World addresses some of the reasons. Oil-related revenues have allowed some Oklahoma districts to pay their teachers higher salaries, like Cushing Public Schools. Others, like Pryor Schools, have a Google data farm nearby. Pryor has announced April 2 and 3 will be “snow days” in the district, however, which will give their teachers the chance to participate in the walkout at the capitol on Monday and Tuesday without actually missing classes. Our largest urban school districts, Oklahoma City Public Schools and Tulsa Public Schools, have both announced school closures for Monday but appear to be waiting to see what happens next before making other decisions. An Oklahoma City Public Schools district administrator attending Friday evening’s town hall shared that the district has made multiple contingency plans, depending on how long the walkout lasts. If it goes longer, the district will be required to make up days by adding to the 2017-18 instructional calendar. No one knows at this point what will happen, and if a longer walkout would require teachers and students to stay in class into June. With a graduating senior this year, that’s not a fun prospect, since seniors would still “walk” in their scheduled graduation ceremonies at the end of May, but might still be required by the district to attend classes even though those classes would be held after graduation. It’s a messy situation, and there’s a lot up in the air. Here’s what is apparent when it comes to the urban and rural divide in Oklahoma, however: We need to find ways to address it. Again, community dialog seems vital. If dialog within an existing urban or rural community is hard today, it seems even more daunting to encourage dialog among these communities. Again, however, perhaps the EdCamp unconference model suggests a path forward. This is something we need to keep in mind and work to address intentionally. Whether your schools are open or closed next week, it’s important for us to share how this teacher walkout is certainly NOT about “teacher greed,” and it’s about far more than just teacher salaries. Whether we live in a large city or small town, or out in the country, we all have an important stake in the quality of services our state provides. These state services affect us all, in our schools, our criminal justice system, our foster care system, our mental health system, and many other areas. We need to encourage not only civic participation but also a civic mindset which looks beyond the immediate concerns of our local community across our counties and state. My final takeaway from Friday’s education town hall meeting at Wilson Elementary is that we need continual support for transparency and accountability in state and local government, as well as support for strong local journalism. One of the attendees near the end of the town hall meeting asked a question about funding state government when she continues to hear reports about misuse of funds and inefficient state government. Her question was, why should we vote for more taxes when we continue to hear about problems with state agencies not managing our tax dollars wisely. This is an important question, and the answer (as highlighted by the legislators who responded on Friday) is NOT to continue to cut funding for state government. The answer, instead, is to keep pushing for transparency and accountability. We all need accountability, and state government (as well as government agencies at other levels) are no different. The fact that we can learn about issues of financial mismanagement, political corruption, and other scandals in our press is unfortunate on one level, but it is also fantastic on another. Let me explain. It’s bad and reprehensible that scandals take place in government. We should have elected and appointed officials in all cases acting honestly and responsibly. It’s a fact of human nature, however, that this isn’t always the case. Again, this isn’t something unique to our state, this is part of our human condition. This is why the founders of the United States and authors of our establishing documents like our Constitution and Bill of Rights included “checks and balances” to prevent abuses of power. I’ve been fortunate to both travel and live in other countries in our world, and I’ll be quick to tell you the level of press freedom and openness which exists in the United States is QUITE different than what we find in many other places. My recent visit to Egypt in November of 2017 was a case in point. Certainly we have bias in our press and media, which is EVERYWHERE (read “Amusing Ourselves to Death: Public Discourse in the Age of Show Business” by Neil Postman for more on this) but we still have a comparatively open and freer media society than many other countries. We need to support journalism locally and on larger scales, to promote accountability and transparency. The “fourth estate” is an essential element of our democratic system of government, although you’d never know if you follow the tweets of our 45th President. This is true at the state and community level, as well as the national level. We also need to figure out how to navigate the downsides of term limits. As Representative Cyndi Munson (@CyndiMunson85) discussed in Friday evening’s town hall, we sharply limit the potential for elected officials to develop expertise and wisdom in different arenas of public policy when we force them out of office every 12 years. Government is NOT inherently evil, and elected officials are not all our enemies. We need good people of every gender, community, ethnicity, and creed to run for public office in Oklahoma and serve the people of our state with honesty, humility, and passion. We need to come together not only for the immediate goals of providing educators in Oklahoma with raises and finding sustainable ways to fund our state government, but also for the long term goals of promoting more community and civic engagement. We need to come together and remain together because we live in an open and free society, and these rights have been bestowed upon us along with commensurate responsibilities. That’s why we say citizenship involves both rights and responsibilities, not just the former. That’s how I want to feel about the upcoming Oklahoma teacher walkout. Welcome to the revolution. Welcome to the turning point in the history of state government in Oklahoma, when teachers lead the other citizens of our state forward toward the shared goals of providing for our common good together. Radical, extreme voices of conservatism and libertarianism have literally wrought destruction upon not only our state agencies and public schools, but also left a scarred legacy upon the lives of our students and teachers in public schools in Oklahoma. Enough is enough. Let the peaceful, respectful, and resolute revolution in Oklahoma political culture begin. Nothing less than the future of our state and our nation is at stake, and we all have important roles to play through dialog in the days and weeks ahead.